I’m someone who needs to-do lists. If I try to carry around everything I need to do in my brain alone I forget things (including deadlines), and I feel a tremendous pressure to not forget things, which is a terrible one-two punch. I’m constantly searching my memory for things I know I’m not keeping track of, and when I do remember those things it’s usually somewhere inconvenient – the shower; in bed as I’m falling asleep; at the grocery store. But to-do lists are a bear. 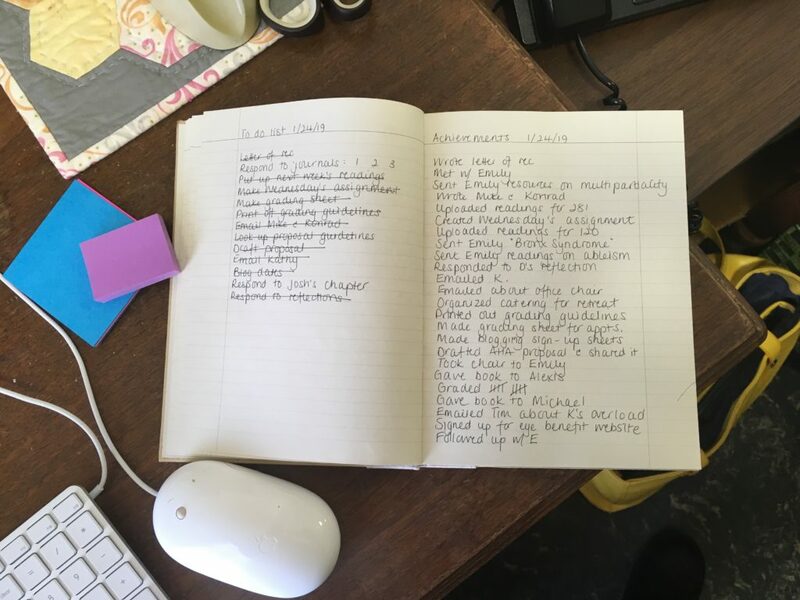 If I keep an honest accounting of everything I should be doing, it’s more than I can possibly achieve in any single day, and if I accept that part I still feel overwhelmed when I finish work and there are inevitably still things on the list. I fret about those things. I frequently feel like I didn’t accomplish enough. So I’ve started a new practice. I still make to-do lists, but on the facing page of my notebook, I also make an ‘Achievements’ list. Every time I do something, I not only cross it off my to-do list, but I write it down on my achievements list. I also write down everything else I do between times. We do a lot of things at work (or in our working hours) that we don’t give ourselves credit for, like impromptu meetings, or chasing someone down to give them a book we think they’d find useful, or sending a dozen administrative emails (and then some). So, for example, you’ll see on my to-do list I wrote “Respond to journals 1 2 3.” I have three sets of journals I need to read and comment on, and I didn’t get that crossed off my list yesterday. But you can also see, under achievements, that I kept a tally of how many I did grade – 10 from one set, which is really satisfying. If I went only by my to-do list, and the things crossed off, I’d feel a sense of baffled wonder (“How did I work all day and only get this much done?”) as well as a sense of dissatisfaction, because there were two big things left undone. But when I look at my achievements list I get a sense of accomplishment, of hours well-spent, of satisfaction, and even a little bit of pride. So if you’re someone who finds that to-do lists are a little tyrannical, try keeping an achievements list, too. See if it lifts your spirits the way it does mine! I really like this idea a lot. I’m going to give it a try. Thanks, love!